Turtle Talks | Turtle Talks Episode #3: What is Energy? Monica: How we live with energy can be a fairly abstract experience. 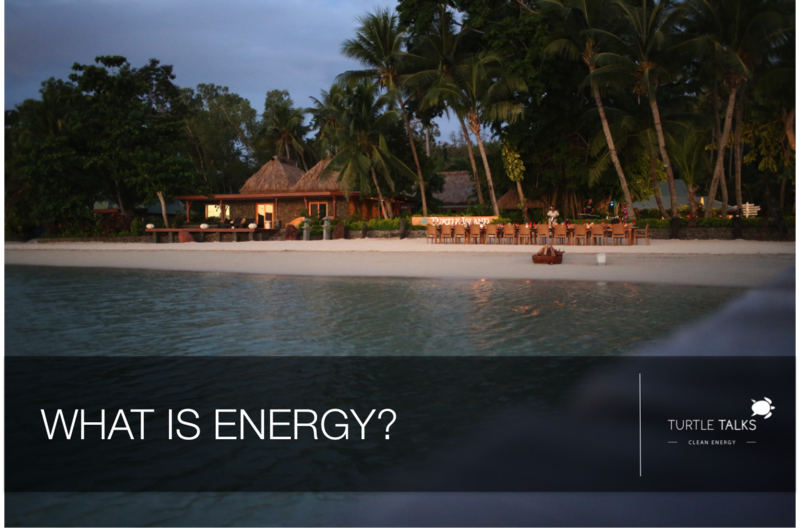 How can people understand and identify with daily energy choices? Michel: I find that people are actually quite aware of their energy consumption patterns. 100 years ago, the average American spent 0% of their income on education and 2% of their income on transportation. Fast forward to 2000, when lower- and middle-class Americans spend 50% of their income on education and transportation because their lifestyles require daycare and a long commute. Nearly every day people fill up their gas tanks, and every month people pay their electrical bills. So, people are aware. If a clean energy future means that they pay less for energy, that they get to spend more time with their kids and less time on a freeway, then they’re happy to make the shift. It’s just that people live very demanding, busy lives, and so they would prefer that a shift to clean, more affordable energy occur without significant change or upheaval to their day-to-day routines. Monica: Fair enough. I can relate to life being busy. As a consumer of energy, should I care about the sources of the energy I consume? Michel: Absolutely. We each experience daily the effects of our fossil fuel dependence. For starters, we all drive more than we’d like, which is an artifact of our fossil fuel infrastructure. Many of us spend hours commuting to our places of work, away from our towns and families, because an abundance of fossil fuels has enabled us to create places of work that exist outside our communities. And as we drive, we create air pollution that leads to respiratory ailments like asthma. Our communities would be so much more vibrant if we walked our children to school, worked locally, interacted with our neighbors, and enjoyed family time in the evenings. Beyond our own communities, our hunger for fossil fuels has created an imbalance in our economy. Every year we import $300 billion in fossil fuels, which is our single biggest trade item. And, to protect our interests in these natural resources, we have engaged in a $3 trillion war in the Middle East. We are sending our children into these geo-political conflicts. A system in which the United States –the most profligate user of energy in the world – transitions to a clean energy future can really set the bar for the rest of the world. Surely here in the 21st century, the idea that people are fighting wars or suffering because of scarce resources seems absurd. We know how to profitably generate energy from renewable sources at scale. Monica: Perhaps we are so used to living this way, and we’re so busy living this way, that it’s difficult for us to imagine what it would be like to live any differently. What would it be like to live in a world powered by clean energy? Michel: A clean energy world is a world in which we are all working less hard to just move around and to be with one another. We would work closer to our homes, and clean energy related jobs, in particular, would exist in our local communities. Our children would go to school closer to home. You would regain the time you used to spend commuting, and instead be in proximity to your friends and family. A clean energy future offers all the mobility you want with a lot less wasted time; more disposable income to spend on things you actually enjoy and not on transportation services or lighting; and healthier families with the decline in air pollution. Monica: Michel, you’ve dedicated your professional life to environmental, energy and social justice initiatives. Why? Michel: Since a young age, I’ve been called to social justice. And along the way, I came to understand that our environment shapes our health, happiness, and prosperity. If I reflect on my career to date, one of my most tangible accomplishments has been drafting legislation that now collects $3 billion annually in carbon charges. As a Black American 30 years ago, I brought a different perspective and life experience to environmental matters. In fact, I have seen for some time that the issues of global warming and inequality are closely related. For me, this connection is the seed of what I would call the “climate justice movement,” which is getting more well-known globally. In this framework, justice is a crucial component of the climate conundrum. I fundamentally believe that all our lives will improve as we switch to clean and renewable energy sources. Monica: So, Michel as you and your colleagues champion these changes, do you need support from us energy consumers? Michel: Each and every one of us count, primarily in two ways. First, pay attention and vote. Policy matters. Second, act wisely and make conscious, judicious buying decisions. For example, when you buy your next car, buy a clean vehicle. If you can, switch to clean energy sources. Make your house more energy efficient. Together, all of our choices really do make the difference. About Michel Gelobter: Michel Gelobter is the author of the upcoming book, Lean Startups for Social Change: The Revolutionary Path to Big Impact. Michel has held senior positions in advocacy, government, academia, and business, with focus on environment, energy, and social justice. He has been Senior Advisor to the David & Lucille Packard Foundation, co-founded BuildingEnergy.com, and Cooler, a company whose mission is to connect every purchase to a solution for global warming. From 2009 until 2011, Michel served as the Chief Green Officer for Hara Enterprise Environmental Management, a Kleiner Perkins portfolio company acquired by Verisae. As an advocate, Michel co-founded a number of environmental justice, water, and oceans organizations and led Redefining Progress from 2001 through 2007, where he worked to originate and design the world’s most aggressive climate legislation (California’s Global Warming Solutions Act). Michel founded the Program on Environmental Policy at Columbia University’s School of International and Public Affairs. His government service has included staffing the U.S. House of Representatives Energy and Commerce Committee and serving as Assistant Commissioner for the New York City’s $2 billion-a-year water utility and environmental agency. Michel earned his B.S., M.S. and Ph.D at U.C. Berkeley, and is an alumnus of Deep Springs College. He presently serves as a Board member of the California Clean Energy Fund, the Natural Resources Defense Council, Ceres, and the African-American Advisory Committee of the Spence-Chapin Adoption Agency. He lives with his three children in Berkeley, CA.